The lightest and newest tow bar in the Blue Ox line is the all-new Aladdin. Its direct-connect, fold-away design is a proven favorite among towing enthusiasts. Ultra-light, ultra-strong aluminum tow bar; weighs just 17 1/2 lbs. Self-aligning to allow simple one-person hitching and unhitching. Folds and stores directly on the RV. Unique pivot design eliminates ball mount, ball coupler and hitch ball, reducing concerns about ball height. Roadmaster towbars are unsurpassed for strength and longevity. Relentless testing & high standards assure the safety of you and your family. The Falcon eliminates the need to lift the tow bar off the front of your car. In seconds, the Falcon can be easily stored on your motorhome. The Falcon mounts directly into a 2″ receiver. There is no ball mount or ball. Allows arms to adjust for an easy, one-person hook-up. Stainless steel assures trouble-free operation. The Falcon incorporates bushings at the swivel points that help support the weight of the tow bar during the hook-up and unhook procedures. Stainless Steel prevents corrosion that binds. It also allows smooth and easy operation of the tow bar. 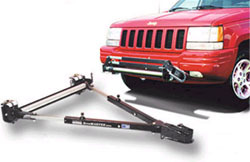 Thanks to its unique self-supporting quick-disconnects, one person can quickly and easily mount or remove the tow bar in seconds. Only StowMaster utilizes a full-length angle iron support across the rear of the bar to guarantee strength and durability. The StowMaster has steel plugs which seal the ends of the arms to help prevent moisture and debris from corroding or degrading the operation of the bar. The Autowlok System allows arms to adjust for an easy, one-person hook-up. Stainless Steel assures trouble-free operation. Other brands of tow bars can be coupled to the motorhome without locking the slide collar. When this happens, the collar can freely slide across the steel tube allowing the car to dangerously wander behind the motorhome. The design of the StowMaster eliminates this hazardous possibility. Our exclusive internal safety strap adds an additional measure of safety by preventing the separation of the tow bar in the unlikely event that the primary lock should not function. Only StowMasterTM uses self-lubricating nylon bushings to eliminate friction between the inner and outer arms. Others have steel riding on steel.